Dept. of Sportsing: If the NFL playoffs began this week, the Rams would host the Falcons in a wildcard game at the Expo Line and Silver Line friendly Coliseum. Considering both teams have potent offenses, that could be a pretty entertaining one. Down in the South Bay, the Chargers are 5-6 but only one game behind the flailing K.C. Chiefs. If the Chargers win the AFC West, they’ll also get a wildcard game at StubHub Center, which is served by a Long Beach Transit shuttle from the Blue Line’s Del Amo Station and Metro’s Harbor Gateway Transit Center, which serves the Silver Line. Dept. 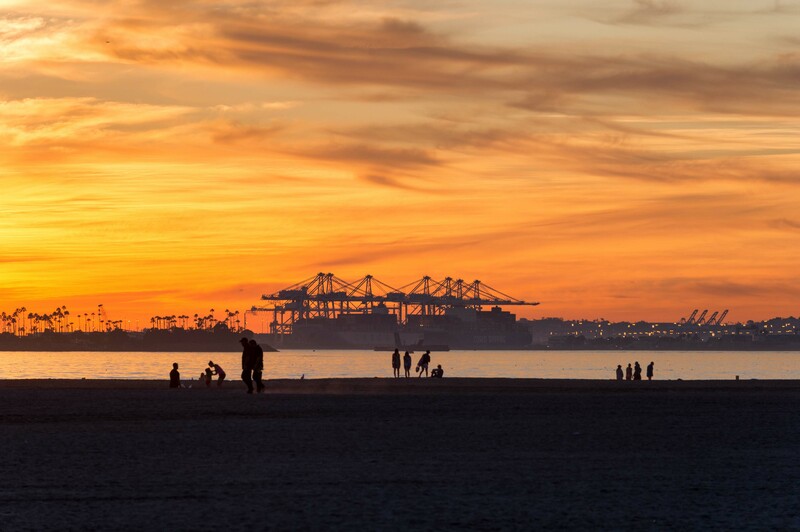 of Sunsets: Speaking of Long Beach, nice sunset on Friday although the air quality around our region was seriously no bueno for most of last week. Some interestingness here. South Pas is hoping to use signage and more turn lanes to “nudge” traffic from Fremont to Fair Oaks and Huntington. Fremont is a narrowish street in South Pas that gets hit with traffic moving between Pasadena and Alhambra. The city also wants to use Metro funding to grade separate two Gold Line crossings — at the adjacent Monterey and Pasadena Avenue intersections. The article also says that Pasadena wants to separate the Gold Line crossing of California Avenue, where frequent backups occur when the gates are down, especially during rush hour. Good and heartbreaking op-ed by staffer Matthew Fleischer who points out that fatalities in car-pedestrian accidents is up 58 percent in the past two years even though the number of accidents is about the same. In other words, speed kills. Matthew argues for a lot more of the type of street infrastructure — raised crosswalks, road diets etc. — that can slow cars down. As I’ve said in the past, I’d like to see a lot more enforcement around intersections and crosswalks around the entire region. I see far too many people blasting through red lights and not stopping at crosswalks where there are no traffic signals. If motorists thought there was a real chance they’d get a really expensive citation around intersections, perhaps they’d think twice before doing something stupid/reckless/dangerous. The L.A. City Council approved community plans last week for parts of South L.A. The focus is on building more housing near transit stops and reviving commercial corridors. That makes sense. Streetsblog LA has a longer post that dives into the details. Not everyone got what they want and there remains serious concerns about affordable housing and gentrification. This issue has been getting some commentary on the Internet lately. The city of L.A. is proposing to change the zoning rules near the Expo Line to allow 6,000 new residential units. Some say that’s not nearly enough to help with the area’s housing crisis, others say it’s too much. The adjoining council district has taken a harder line. Koretz told the Planning Commission this month that the areas surrounding three Expo Line stations in his district “simply cannot support” more density without improvements to streets and other public infrastructure. Moral of the story: think twice before posting a sign saying “Happily gentrifying the neighborhood since 2014″ in the window of your coffee shop. Re pedestrian safety: I live in the Bay Area and sometimes visit LA. I’ve noticed that, per mile driven, I see more instances of reckless driving in the LA area than in the Bay Area. (Lowest priority) Allow pedestrians to cross the street. I’ve sat there for 5 or 6 minutes waiting for a walk signal to cross Arroyo Parkway, while the eastbound California Blvd traffic gets an extended green light when there are zero cars coming through, and none approaching (since the crossing gates are down). I actually actively avoid walking along or across Arroyo Parkway whenever possible because of this, even if that means driving only a few blocks instead of walking.